This is a five day class with a minimum of 40 hours. 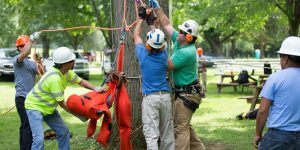 This class is designed for individuals who have completed the ACRT Arborist Training Basic Arborist class, or have at least two years of on-the-job experience along with some formal training. This class is limited to 12 students at a time and instruction is done both hands-on and in the classroom. This is a five day class with a minimum of 40 hours. This class is designed for individuals who have completed the ACRT Arborist Training Basic Arborist class, or have at least two years of on-the-job experience along with some formal training.